Before you arrive at our beachfront paradise, know what to expect by reading answers to questions guests have about our Playa del Carmen resort. If your question was not answered below, please email our team and we will be happy to assist you. How far is town from the hotel? Mahekal Beach Resort is located near downtown at Playa del Carmen. Located at 38th St. North and the beach and a short 2 blocks from the famous 5th Avenue (Quinta Avenida). Is it safe to walk into town? Playa del Carmen is generally a safe tourist destination welcoming guests from all over the world, however we advise taking precautions with money, jewelry, cell phones and other valuables. Mahekal offers two levels of fast WiFi service throughout the resort. Basic complimentary WiFi is perfect for keeping in touch with your e-mails, uploading pictures of your vacation and listening to music. Higher speed, premium WiFi is available for an additional fee and is ideal for guests who want to stream feature length, dense movies or play media rich games. Guest rooms offer both wired and wireless options; with basic service included for free. Is there any loud music near Mahekal? Mahekal offers a quiet and relaxing atmosphere in a tropical setting. From time to time, there are festivals and special events held at off-site locations that may have loud music, typically during the day time hours. If you are concerned about these events, please contact Guest Services at guestexperience@mahekalplaya.com. Is there an all-inclusive option for the meal plan? Currently Mahekal only offers a Half-Board meal plan (Breakfast & Dinner or Lunch). You can exchange dinner for lunch, daily, through our guest services desk. For special packages consult our Reservations department at reservations@mahekalplaya.com. How much do beverages cost? At Mahekal we offer a variety of drinks from mocktails (non-alcoholic) to our famous signature Margaritas and our selected wine list. Prices might vary depending on the drink and alcohol (Domestic versus International). We provide a daily happy hour from 5:00 to 6:00 p.m. in all bars at our hotel in Playa del Carmen. The price of beer and cocktails vary from $2.50 - $8.00 USD depending on the brand and ingredients during Happy Hour. Non Happy Hour prices are slightly higher. Pricing is subject to change. How is the quality of the wine at Mahekal Beach Resort? Each of the wines we feature at the resort have been carefully selected by the Chef to compliment the meals and food creations. Our vision is to offer a selection of wines for all tastes. Many are highly rated by Wine Spectator, Robert Parker (RP) and Stephen Tanzer (ST). Do you offer vegetarian menu options? Mahekal offers an extensive menu to suit all tastes. If you have a food allergies or dietary restrictions, please inform Guest Services at guestexperience@mahekalplaya.com so we can better assist you. What's the difference between Ocean View and Ocean View Palapa? Ocean View Rooms are located on the ground floor. Ocean View Palapa can be an individual Bungalow or can be located on first or second floor, but will always have a Palapa roof. Room location is subject to the hotel's availability and can not be guaranteed prior to arrival. Can we reserve a particular room or bed type? We do our very best to accommodate requests for specific rooms and bedding preferences (Kings or 2 Double Beds). Due to the arrival and departure schedules and room demand, reserving a specific room or bed type is not always possible. Therefore we cannot guarantee a specific room or bedding preference. We will do our very best to accommodate your wishes and to make your stay in our resort a relaxing and enjoyable one. Do all of the rooms have a fridge? Our rooms do not have mini-fridges, however we can provide one for your room based on hotel availability for $10.00 USD per day. All of guest rooms have been recently renovated and all rooms have brand new air conditioners with remote controls. In addition, all rooms have ceiling fans. What types of watersports are available? Playa del Carmen and its surroundings offer a variety of water sport activities such as Waverunners, Paddle Boards, and Jet Ski rentals. For further information contact Guest Services at guestexperience@mahekalplaya.com. If water is what you crave, the Vida Aquática Dive Center has dive programs for all ages. From shallow dive trips, to cenote exploration, to deep water full day dives, our on-site dive center can help make your underwater experience both magical and memorable. Do you have bikes available for rent? Playa del Carmen is a bike-friendly town and Mahekal has wonderful new bicycles for our guests. We offer bike rentals per hour (40MXN) and per day (160MXN) or $2.75/hr or $10.75/day USD. Please stop by the concierge for more details or to reserve a bike. Do you have kid-friendly activities? While we do not have a dedicated "Kid's Club", we offer many activities catering to children. Kids will enjoy Ping Pong & Pool Tables at Boli's Bar. Children also love the zero entry pool in the Caribe Section of the hotel and our ceramic painting classes, located on-site near Boli's. Our dive center, Vida Aquática offers beginning dive lessons. The "Bubble Maker" course is offered to children 8 years and older and introduces kids to the wonderful water world around Playa del Carmen. How we do get to the hotel from the airport? We offer an excellent private transfer service that provides clean, comfortable & secure Round Trip and One Way transfers in vans identified with the Mahekal logo. Please contact our Guest Experience Team at guestexperience@mahekalplaya.com and they will arrange all the details. Round Trip pricing is approximately $120 USD + 16% tax. (Pricing subject to change). Do you recommend renting a car to drive to the hotel? Once you are at the resort you won't need a car, however, there are many car rental options to choose from at the airport. Parking is limited at the resort and is only available on the street. Parking is not secured and is at the renter's risk. Due to our privileged location in downtown, we do not offer local shuttle service. Transportation arrangements can be made for all of the attractions in the Riviera Maya through our concierge. Is there laundry available for guests? Mahekal does not provide self-service laundromats for guests. We do offer laundry service through an external service with standard delivery or express service. Please contact the Guest Experience desk for more information. Do you have babysitting services? For your convenience, Mahekal offers on-call babysitting services. Reservations can be made through our concierge at concierge@mahekalplaya.com. 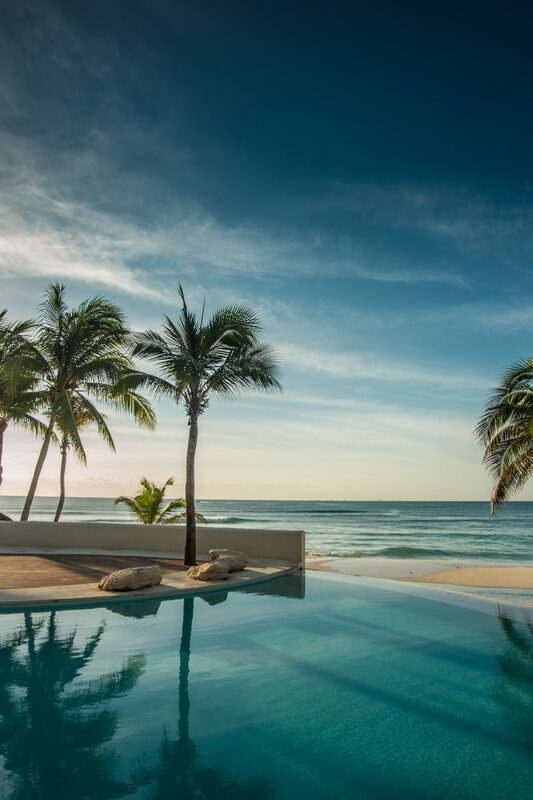 Learn more about the Mahekal Experience package -- a unique Playa del Carmen resort deal.